PEACEMAKER, featuring vocalist Ronny Munroe (ex-METAL CHURCH), are set to unleash their debut album on September 25th. Featuring members from METAL CHURCH, TSO, HOUSE OF LORDS, YNGWIE, ANTHRAX, and TANGO DOWN, 2018’s Brutal Planet Records debut Concrete & Terror takes the band’s collective genius and unites these brilliant musical virtuosos in metallic triumph and victory! Miller’s snarling guitars hammer away with ferocious tones, Zampa provides a true drumming onslaught, and Ciejek is a top-ten bass player thumping it out with perfection! While few people have the distinguished resume’ of vocalist Ronny Munroe, he delivers the performance of a lifetime pushing himself to new heights of creativity and technical proficiency. Check out a lyric video for the album's title track streaming below. The PEACEMAKER album cover introduces you to Zombie Sheriff J.P. Diggs who embodies the heart and soul of the All-Star heavy metal band, PEACEMAKER! The message of Sheriff Diggs and PEACEMAKER is clear....”Make your peace....with PEACEMAKER!” The album artwork steps far beyond typical knuckle-dragging genre defining metal nerdness, as much it intensifies and sears the senses with mind-melting music. 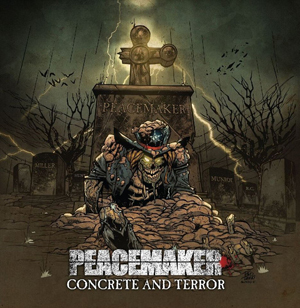 Make no mistake, PEACEMAKER delivers a modern day old-school heavy metal album that has all the “balls” and whistles - an album that is nothing less than the "total package" that you would expect from the All-Star, super-team heavy metal crew that makes PEACEMAKER so very special! If you would like to save on shipping, you can place your PRE-ORDER along with any other in-stock item and all items will ship together once the pre-orders come in stock. If you prefer to have other in-stock items ship ahead you need to place separate orders for any and all PRE-ORDERS. All pre-order incentives are while supplies last. If the CD sampler runs out, we will provide MP3s via e-mail.